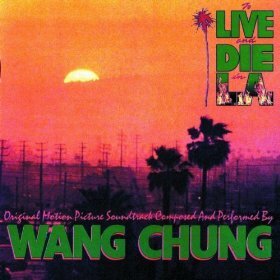 The 339th Soundtrack of the Week is To Live and Die in L.A. by Wang Chung. This William Friedkin movie is basically a transposition of Friedkin's famous The French Connection. L.A. instead of NYC, counterfeiting instead of drug smuggling and so on. It's a decent movie, though. I don't remember how the music works in the movie but I enjoy listening to this very '80s soundtrack album. Wang Chung! Who would have thought it? The title song is great, cold and rhythmic but with flourishes of emotion and lyricism. "Lullaby" is a soft funky tune, romantic and pulsing. "Wake Up and Stop Dreaming" reminds me of a David Bowie take on Phil Collins's "Take Me Home" (which I only know because it was on Miami Vice). A groove similar to The Pretenders' "Don't Get Me Wrong" provides the foundation for "Wait". "City of the Angels" is an intense instrumental that probably could have fit well into an episode of Miami Vice, while "The Red Stare" is a creepy piano piece. This is followed by another instrumental, the pounding and relentless "Black-Blue-White". The record closes with the five-minute instrumental piece "Every Big City", quasi-industrial with different sections but always a steady beat running throughout.